Advanced's ExGo suppression control panels have been installed in a £20m, state-of-the-art data and high performance computing centre at the University of Cambridge. The UK’s newest Harvey Nichols, which recently opened in Birmingham, is protected by industry-leading intelligent, multiprotocol fire panels from Advanced. An Advanced Axis AX fire system has helped an Arizona school overcome installation challenges and save it money. Advanced protection for the International Peace Education Center in Las Vegas, Nevada. 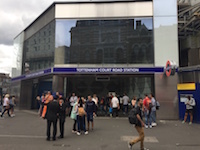 Advanced MxPro fire panels are now protecting London Underground passengers at the flagship Tottenham Court Road Station on the Northern Line. Advanced MxPro 5 fire panels have been chosen to protect the historic, Grade II listed Empire Hotel building in Bath, Somerset, UK.